The following instructions are specific to the WAVE OnCloud 1.0 WAVE Mobile Communicator Client. For instructions on using the WAVE OnCloud 2.0 Application see Tutorial: WAVE OnCloud Application Overview. A Private Call is a private connection between your WAVE Mobile Communicator and one other member. Private Calls are half-duplex. Only one member can transmit at a time. Private Calls are initiated through the Members list or the CONTACTS list. The Members list only displays WAVE members signed-in on the currently selected Talkgroup. The CONTACTS list displays a collection of WAVE and radio members specified by your Address Book in the WAVE OnCloud. Not all members in the CONTACTS list may be signed-in or available for Private Calls. To add or remove members, consult your WAVE OnCloud Customer. On any Talkgroup screen, tap the Members icon to open the Members list. Tap the Member you wish to call. Press and hold the Push to Talk button. 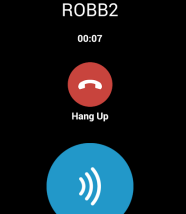 All Talkgroup audio is muted and Private Call screen appears displaying the name of the member you called and a Hang Up button. The WAVE Mobile Communicator displays ‘Connecting’ to indicate a connection in progress. On successful connection a short double chirp plays and the PTT button animates. Once the call is connected you may begin speaking immediately. Release the Push to Talk button to allow the other member to transmit. Tap the red Hang Up button to terminate the Private Call. Once the call ends, Talkgroup audio resumes immediately. On the Home screen, tap CONTACTS to open the Contacts list. Tap the red Hang Up button to terminate the Private Call. Once the call ends, all unmuted Talkgroup audio resumes immediately. Private Calls are “barge-in” calls. Receivers of a Private Call do not need to accept the connection. The connection is active immediately. The Members list shows the members on the selected Talk Group only. Other members may be available. Switch to a different Talk Group to check for other members. The Contacts list displays the members assigned to your account. The Contacts list is not specific to a Talk Group. Private Calls timeout and automatically disconnect if no audio is transmitted over the call for fifteen (15) seconds. Each transmission resets this timer. The maximum duration of each transmission is 60 seconds. After this, the Push to Talk button turns red and an error tone sounds.